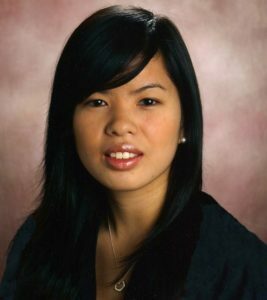 Dr. Christine Nguyen is a board-certified ophthalmologist and eye surgeon who specializes in small incision cataract surgery and glaucoma. She provides a special emphasis in treating glaucoma, from diagnosis to treatment, from medical therapy to lasers and surgery, ranging from minimally invasive glaucoma surgery to more invasive glaucoma surgery such as Trabeculectomy or Tube Shunts. Dr. Nguyen earned her B.A. in Biology & Psychology at the University of Southern California and went on to earn her Doctorate of Medicine degree at Georgetown University School of Medicine in Washington, D.C. She concluded her fellowship at Doheny Eye Institute-UCLA after completing her residency in ophthalmology at Gavin Herbert Eye Institute, University of California, Irvine. Dr. Nguyen is a member of the American Academy of Ophthalmology, the American Glaucoma Society and the American Society of Cataract and Refractive Surgery. Dr. Nguyen enjoys bowling and spending time with family during her leisure hours.